The location of Corinth had been important during the Greek period, situated near the Isthmus, the land bridge between the Peloponnesos and mainland Greece, as well as having ports on the Saronic Gulf and the Corinthian Gulf. In the new foundation of 44 B.C. the Romans utilized many of the existing Greek buildings in the design of their own city, although the organization and city plan of the Roman colony was different than its Greek predecessor. Additionally, evidence exists for what are likely to be several phases of Roman agricultural land division (centuriation) of the territorium of the city. There is also epigraphical, numismatic and now archaeological evidence for a refoundation of Roman Corinth as Colonia Iulia Flavia Augusta Corinthiensis under Vespasian in the early 70's A.D. 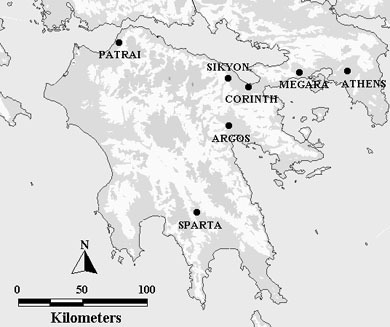 This map illustrates the comparative sizes and locations of the Greek and Roman cities of Corinth. The Greek city includes the area within the 5th century B.C. wall circuit. Fortification walls also enclose Acrocorinth and the area within the long walls to the Corinthian Gulf. The location of the west long wall is hypothetical and is reconstructed by the Corinth Computer Project, based on a study of the field and property lines of the area to the north of the city. All of the walls are indicated in grey on the map. The urban aspect of the Roman colony of 44 B.C. was planned to occupy a large portion of the area of the former Greek city. The location of the Roman city is indicated in blue and the area of the forum is indicated in red. The cardo maximus, also known as the Lechaion Road, is shown as a white line. The groma was the principal surveying instrument of the Roman agrimensores, the land surveyors. The instrument itself was simple in design, crossed arms resting on a bracket and attached to a vertical staff. The four arms each had a cord with a hanging plumb bob. It was designed to survey straight lines and right angles. On the right is a drawing of a replica of a groma now in the Science Museum, London. The original metal parts were found in the Workshop of the surveyor Verus at Pompeii, and are now in the Museo Nazionale, Naples. Click on the plumb bobs or the pointed end of the staff to see photographs of the original parts. We are fortunate to have the tombstone of a Roman surveyor with a sculpted relief, figure to the left, which depicts certain attributes of his profession. It is the tombstone of Lucius Aebutius Faustus, of the first century B.C. and is in the Museo Civico at Ivrea in Northern Italy. Lucius Aebutius Faustus, freedman of Lucius Aebutius, of the tribe of Claudia, surveyor, sevir, erected this monument while still alive for himself and his wife Aria Aucta freedwoman of Quintus Arrius, and their children, and the freedwoman Zepyra. The component parts of the sculptural relief are the following: In the pediment are a shield and spears. Beneath the inscription is a dismantled groma. Above this are the symbols of a sevir, two fasces and between them a low seat. O.A.W. Dilke, "Roman Large-Scale Mapping in the Early Empire," in The History of Cartography, Volume One, Cartography in Prehistoric, Ancient and Medieval Europe and the Mediterranean, J.B. Harley and David Woodward, eds., Chicago, 1987, pp. 212-223. These plumb-bobs are examples of what Roman carpenters, bricklayers, and surveyors used to trace vertical lines and to determine horizontal planes. Plumb bobs are usually conical and are either made of bronze or iron. The point (to the right), usually made of bronze, was placed on the end of a staff to secure the groma in its position before surveying. It is possible that this example was used either on a groma or on a measuring staff. (1) For a general discussion of the history of Corinth during this time period, see James Wiseman, "Corinth and Rome I: 228 B.C.--A.D. 267," Aufstieg und Niedergang der Romischen Welt II, 7.1, Berlin, 1979, pp. 438-548.